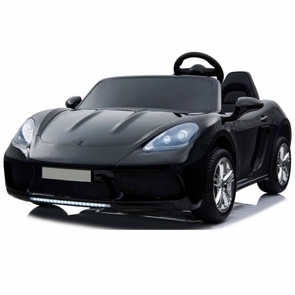 BIGGEST Class Porsche style ride on cars for kids to adults are battery powered and can hold up to 200 pounds. Yes, this ride on car is remote controlled too, so you have the option of overriding the child's controls! This is a stylish and cool ride on car that is great for ages 1-99. 10 year old kids love it! The adult rider in the pictures is 5'8" and 180 pounds so please base your size judgement on the picture of if you can fit. If your kid is into exotic cars and you want them to cruise in style, then this is the ride on car for you. Full function steering allows your child to drive forwards, backwards, left, and right too. Plus it plays music at your command and has an MP3 player input. A must have for all little sports car enthusiasts. Yes we have black, red, and white available as well. Want more? Comes with adjustable seat belt and the headlights/taillights work too. Feel good! This Magic Cars® model arrives free with the best in class 1 year bumper to bumper ride on car factory warranty. Use the remote control and play with a REALLY big RC car. You get the best of both worlds with this fantastic ride on sports car. Plus, we carry all spare parts. Watch the official Trend Times Magic Cars® remote control ride on RC car commercial below and enjoy what is so amazing today. Not into sports car ride on toys? See our entire line of Ride On Cars and toys at our online toy stores. Warranty and/or service is readily available and provided via the manufacturer. My son has special needs and can not drive without running into things. This is great since my husband can now drive for him. My son is six years old and still the size of a three year old so he will get lots of joy out of this! Just purchased one for our 10 month old daughter. We love it and so does she. Son totally loves it and its my hubby's toy too. Father son bonding time. This car is wonderful my two year old loves it. My husband does too he says he has the biggest r/c car in the neighborhood. I didn't realize it had working headlights. cool and the kids think so too!